7+7=14 is simple math but also today’s date. Must be something magical in that, but not sure if there are any official groups that have a definition of what the date 7/7/14 could mean for us – the ones who need meaning, wealth and health. I will step forward, daring to declare this is a damn good date, full of love, magic and possibilities. That seems presumptuous and brave to declare such a thing, but it feels right. It’s a part of my boldness and I was reminded of this in a recent post from Mastin Kipp of The Daily Love. I added it here in my Daily Love section under Mental Love. This 4th of July holiday weekend I had time to celebrate independence and remember the one of the past. One 4th of July nearly 20 years ago I gained independence when I discovered my boyfriend at the time was cheating on me. It felt like the worst 4th of July ever in the history of the USA, but I was just being dramatic. It actually turned out to be one of the best days for me and true to the meaning of independence. Sometimes you must look back to know how magical it is to be where you are today. I went to see Allen Hinds play at The Baked Potato and took this video of an absolutely amazing performance of Ode to Billy Joe. Since I was the videographer you must excuse my amateur technique, cuz I didn’t get the intro in, but you will see magical performances by Allen Hinds on guitar, Matt Rhode on keys, Maxanne Lewis on vocals, Bobby Watson on bass and Donald Barrett on drums. The vid is 11 mins but worth the view. It’s jazz (bluesy jazz) so magic happens when fantastic musicians get together and let their creativity flow and that’s how a 3 minute song turns into 11 minutes. I LOVE jazz! We are lucky in LA to have so many events to choose from on any day, to enjoy. Sunday I enjoyed an afternoon at the California Science Center at Exposition Park to view the Pompeii exhibit. My friend Barbara was in town visiting from Portland and she’s a great companion for museum outings. We commuted to Exposition Park via the Metro line train and walked through the beautiful Rose Garden to the California Science Center. 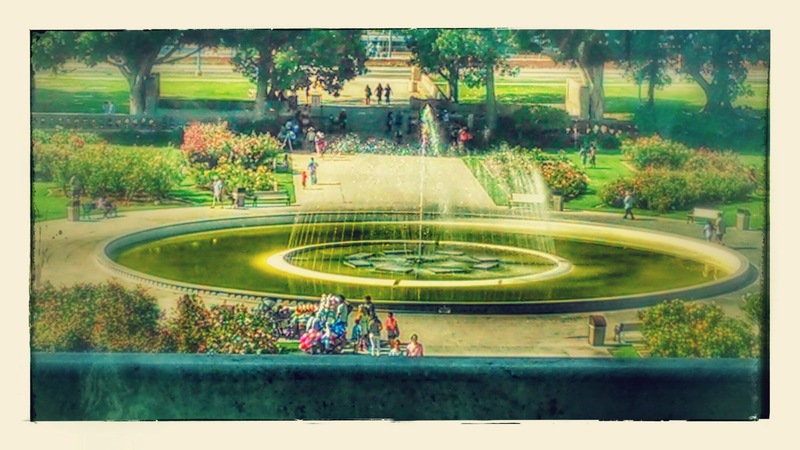 I took this shot of the Rose Garden with my phone from a window in the exhibit hall, and Google added a cool effect that made the photo look like a painting. It looks magical! Sunday wasn’t the best choice of days to go if you expected to be in and out of there in 2 hours. There were long lines and long waits, but we were fortunate to get free admittance to the Endeavor exhibit while we waited. That was good luck! As I viewed the Endeavor, which was breath taking BTW, I felt so fortunate and proud to be an American. When I think about NASA and the many successful missions completed that Endeavor magnificently represents, it was beyond magical. The Pompeii exhibit was incredible. I knew I would enjoy the exhibit because Pompeii has always fascinated me and I also enjoy ancient art. While viewing the beautiful pieces in show, I was really impressed with the artistry and the creativity of the citizens of Pompeii. I learned so much at the exhibit and realized just how advanced this group of people were in the year 79AD. Then at the end of the show there was one room that had the preserved bodies of some people who were frozen in time by the ash of the eruption. Seeing these bodies of stone was like viewing art, but went beyond that… it was something that I can’t really express in words. I was astounded thinking about how these people were overcome by the eruption, unknowing that in 2014 people would be seeing their last moment in life and that their bodies were shipped many miles away from their home to a place that they never imagined. Is it magic that these particular bodies are here in the city of angels nearly 2000 years in their future? I’ve added a galley of photos of my visit to the Pompeii Exhibit and Endeavor here.